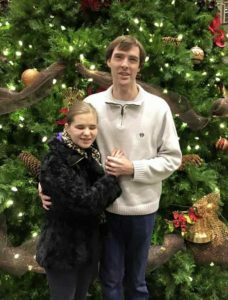 We always think it’s important to report on VIPS graduates and were thrilled when Mary Ann Reynolds, former VIPS staff member and mother of VIPS graduate Ashley Reynolds Linson, and mother-in-law of VIPS graduate Aaron Linson, sent along a progress report of Ashley’s current life. “She is pursuing a degree in music business at IUS; also enjoys writing songs, playing the piano and violin, singing, and being married. She teaches voice to a class of 10 -15 students once a week at Diane Moore Dance Academy. She also takes dance classes at the studio including clogging and jazz. She is very interested in working with children with disabilities, someday, perhaps, having a job at VIPS. Ashley has made the journey through school with support from my family, friends, husband, and God,” writes Ashley’s mother, Mary. This means that I’m not a part of the statistic of blind people who just get frustrated by college and don’t give it a second chance. Ashley Reynolds Linson with husband Aaron Linson. Get project ideas to help make sensory crafts that help your child learn. ©2018 Visually Impaired Preschool Services. All Rights Reserved. Non-Profit 501(c)(3) Organization.